Today was a turtlely awesome day at camp! 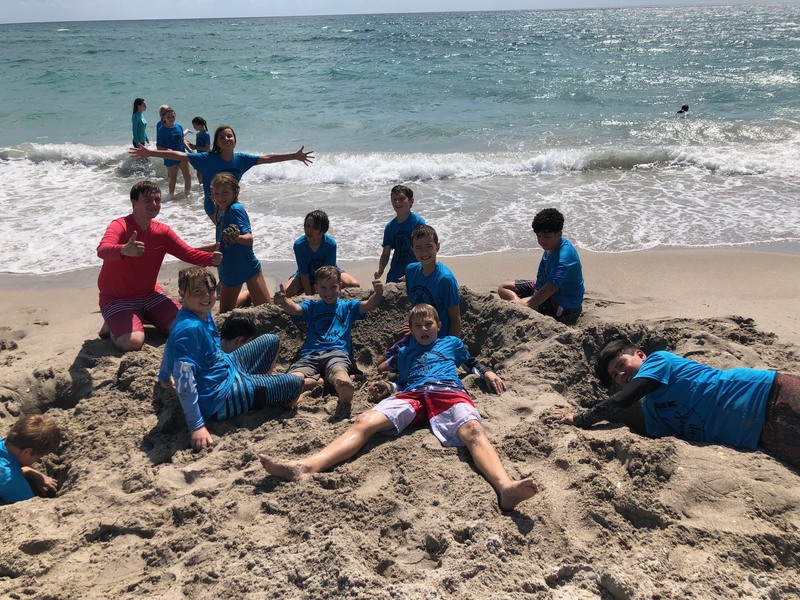 The Loggerheads adventured off campus and visited Manatee Lagoon and Grassy Waters Preserve while the Leatherbacks stayed at LMC to learn about sustainable living! We all walked into camp this morning super excited for our field trip! We answered our turtle questions and then loaded up the school bus! First we headed to Manatee Lagoon! When we arrived we met our Manatee Master and she showed us around the lagoon and inside the learning center. She talked about manatee skeletons and how heavy the bones are. Since manatees are so big, they have heavy bones that help them sink to the bottom to feed on manatee grass. We held some rib bones and looked at what the inside of the bones look like. It was crazy to see how big they were! Our manatee master then walked us over to another wall and taught us about how manatees need warm water to live in. This is why in the winter time, manatee lagoon sees so many manatees. The water in the lagoon is around 72 degrees Fahrenheit which is a perfect temperature for manatees to live in. Then as summer draws nearer, the manatees can swim out of the inlet and explore more places. Then we wandered into the classroom and the manatee master had us come up with hand signals for the different fish species out in the lagoon. She explained that when diving or snorkeling, the researchers can’t talk to each other so they have hand signals to communicate. We had so much fun learning the different behaviors of fish and creating signals for them. After the classroom presentation, we headed out to look for the fish species in the lagoon! We saw some awesome fish out there! There were tarpon, sheep heads, barracuda, and gray angel fish. At the end of our tour, we went over everything we saw in the lagoon with our manatee master before we headed to lunch. At lunch we ate under the huge banyan tree! Then we played some tag and sharks and minnows in the field. Afterwards, we loaded the bus and headed over to Grassy Waters Preserve. We had a blast hiking the boardwalk and looking for all different types of species in the cypress swamp. When we got back to LMC, we had some snack and then it was time to go home! Today we stayed on campus and learned all about sustainable living! First thing in the morning, we decorated our very own compost cups. Ms. Dara explained what composting is and how much it benefits our Earth. We are so excited to continue composting at home and tell our families how to help! Afterwards, we headed down to the beach to have some fun! Unfortunately, the yellow flag was flying because the waves were so powerful today. However, we created some awesome sand castles with our CITs! When the beach became really hot, we went back to LMC and dried off. We went through a power-point right before lunch about sustainable living and how to make our home life healthier for the planet. We learned some great tips like how to save water by taking shorter showers and turning off the water when brushing our teeth. Then it was lunch time! We worked up a big appetite at the beach so we were hungry! After lunch, we had some free time in the turtle yard to visit our favorite patients! We even had the chance to see Tiffany receive her medicine! It was so cool to see how the veterinary staff takes care of the turtles in their tanks. Back in the classroom, we crafted reusable grocery bags we could take home! We couldn’t wait to show our parents so we can use them while shopping. Using these bags reduces the use of plastic therefore, helps save marine life and encourages sustainable living. By the end of today, we felt ready to go home and explain what sustainable living is and how we can all help the environment by doing little things every day! We cannot wait for tomorrow to continue Conservation Kids week!